Swansea midfielder Jonjo Shelvey has been told to "wise up" by manager Garry Monk, who says he will not tolerate the 22-year-old's "laziness" any more. 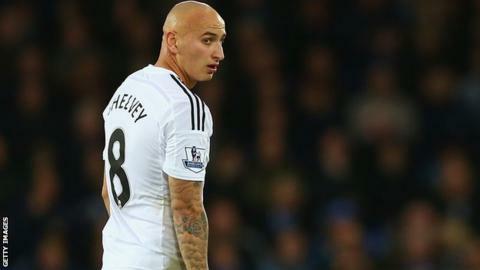 Monk, whose side travel to Liverpool in the Premier League on Monday, says Shelvey has to "learn very quickly". "I have spoken to him a number of times," he said. "We can't afford silly bookings and it cost him being on the pitch against Villa because any slight mistimed tackle could have been a red card. "Jonjo has to wise up because that yellow card came from laziness and he has to be better than that." Shelvey left Liverpool for Swansea in a £5m move in 2013 and has been a first-team regular during his time at Liberty Stadium. He has made 50 appearances in all competitions, scoring seven goals, and in October was called into the England squad two years after winning his solitary international cap against San Marino. This season he was booked five times in the Premier League by the end of October and was sent off at Everton in November after being shown two more yellow cards. "It is about doing your job properly and responsibly, understanding the role you are playing, not just for yourself but for the team," Monk said. "He has to learn this, otherwise he won't play games. We can't afford silly mistakes because we have already been punished for those this season and I can't allow that any more." Shelvey was replaced by Tom Carroll against Villa and the on-loan Spurs youngster is now pushing for a start at Liverpool. Swansea are eighth in the Premier League table, three points above the 10th-placed Reds, and head to Anfield on the back of two wins over the festive period, following up a 1-0 victory at Hull City with a win by the same score against Villa on Friday. Monk says he will not let sentiment stand in the way of selection as he prepares to go head-to-head with his former Swansea manager Brendan Rodgers. "Of course it still means something to Jonjo playing Liverpool but I don't pick players on sentiment," Monk said. "We have games coming up and he will be involved in those games but I wanted to make sure there wouldn't be anything silly going on."